Every so often we get to play a game that changes or revolutionizes a genre. For basketball games, we always had our “arcade” style games: Double Dribble, Arch Rivals and Tecmo NBA Basketball are a few that instantly come to mind for me that I played as a kid that had sim elements but were more of an arcade feel. NBA Jam and NBA Hangtime really changed the way we looked at a basketball game, especially with the implementation of their “Wow!” elements, exaggerated gameplay and the fun we had time in and out playing those games. Over time, various games on various systems tried to relive that fun feel. NBA Showtime: NBA on NBC brought back the nostalgic feeling of the NBA Jam series with some flavor of its own. The NBA Street series released by EA Sports revitalized the genre and was widely and critically acclaimed and well received. But it’s been awhile since we’ve had a viable streetball title to enjoy…10 years to be exact. Enter 3 On 3 Freestyle. Created by JoyCity Games based out of Korea, 3 On 3 Freestyle is based off of two previous titles that the game house created for PCs (Freestyle and Freestyle 2). These games grew to be well received in the Korean gaming market. This new iteration, available exclusively on PS4, is the company’s first venture on consoles. Taking a page from the success of the model on the mobile platform, the game is completely free-to-play. 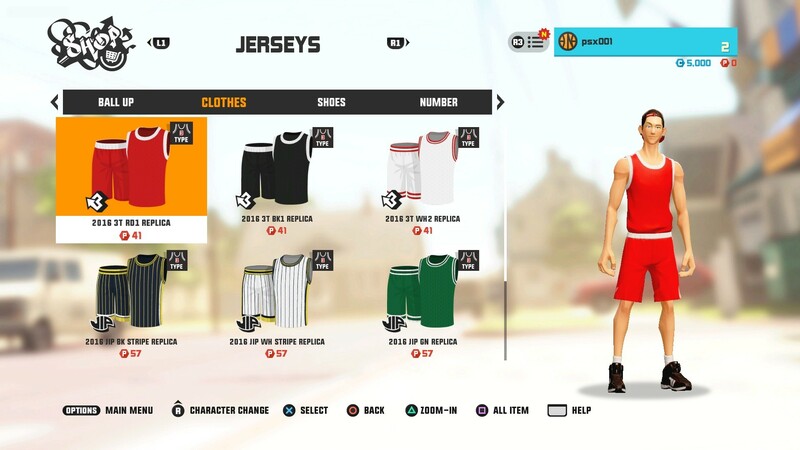 There are microtransactions in-game to boost characters, or get custom outfits and animations, but the main focus of the game is the grind to build up your character(s) and be the best on the court. There is also another game mode that is “coming soon” — no idea what that could be as yet. Playing the game itself, the controls were crisp, as limited as they are. They did take a little bit of getting used to as there aren’t as many commands and controls as, say, NBA 2K17. The pace of the game is slow so don’t expect any NBA Jam-style pace or flashiness. Due to this pace and the fact that your player is at a virtual standstill when you shoot, pass or try to steal the ball, you really want to be smart about what you’re doing with and without the ball. I found rebounding to be the most challenging aspect of the game; you can see where the ball is going, but can’t really judge where it is. Playing the 1 vs. 1 game mode, I found that my CPU teammates’ AI was smart and did the right things. They weren’t all over the place causing me issues. They did what they were supposed to the majority of the time and gave me chances to win more often than not. Playing the 3 vs. 3 game mode with other random people online was fun. Getting an assist, rebound or made basket felt rewarding. I found that the majority of the games I played, my teammates actually tried to move the ball around and set up open shots instead of being “I” players and hogging the ball with their respective characters. 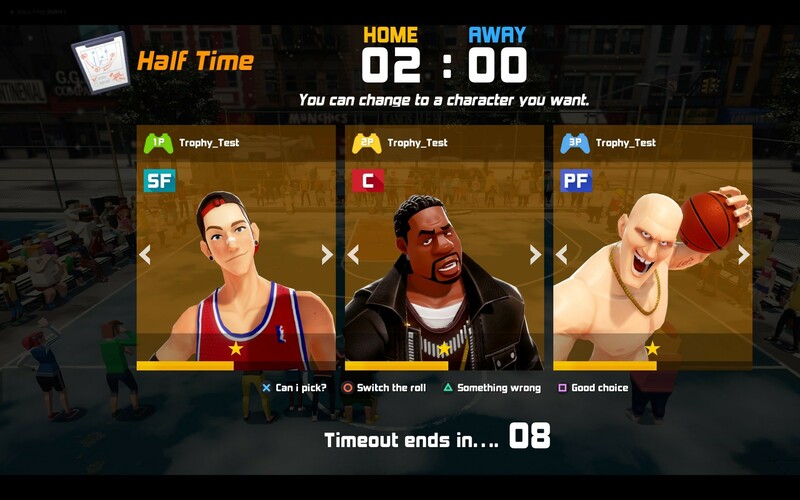 During games, you can change the character that you’re using during timeouts or at halftime. This is key because your character does become fatigued over time and they lose energy. This adds another element of strategy to the game. This game is pretty much an “online only” title. 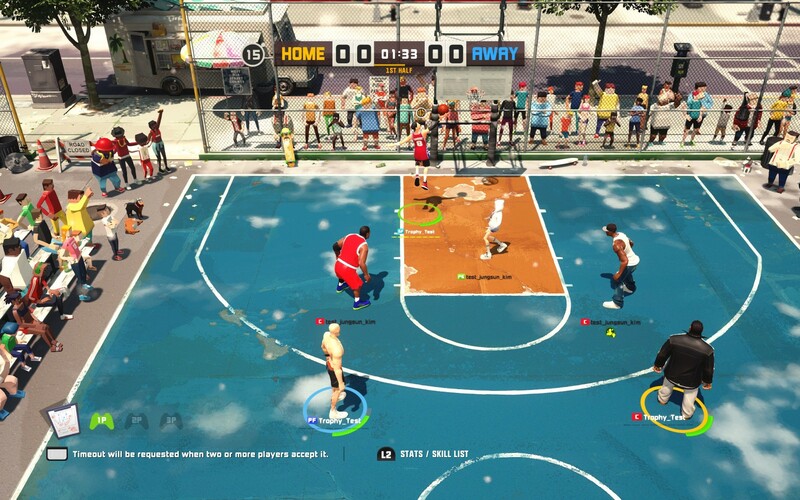 It’s fully dependent on being connected to the 3 On 3 Freestyle servers, otherwise you’re limited to the practice mode. So far the online stability has been no problem at all. I’ve yet to encounter any lag or disconnects. This is, of course, a relief to see. The depth in this game lies in grinding out games to earn coins, which are used to upgrade your characters. Coins purchase “Growth” items. If players don’t want to spend the time to grind and earn coins, they can use real money to purchase “Points.” Points are premium currency used to buy theme packs, clothes and more coins for player growth should you need it. The game has a total of 15 players, five of which you start with. Each locked player costs 15,000 coins to unlock so this is where time spent on grinding comes into play. If you decide to buy a coin pack using points, 56 points will net you 10,000 coins. Earning coins from games played only nets you a few hundred coins, so the game does sometimes force you to make a decision in how you want to earn things if you are starting to get impatient. Each player has a specific skill set that contributes to a given play style. Obviously the better players are the locked players, and upgrading their abilities gives you more flexibility in how you will play the game. These better players, once unlocked and partially or fully upgraded, do bring out the real fun in the game. Each character has a level from 1 to 10. There are also five prestige levels. In order to master a given character, you have to level up the character to level 10, then prestige up to the next prestige level. Leveling up is achieved by buying XP Drinks which come in small (S), medium (M) and large (L) varieties. You can also be rewarded XP drinks for free at times. Prestige levels are achieved by purchasing player manuals, which are available in beginner, intermediate and advanced levels. You’ll also need manuals for the respective position the character plays. Of course, the higher up prestige your character is at, the more XP drinks and manuals you’ll need to level up and prestige. Running off the Unreal 4 engine, 3 On 3 Freestyle is heavily cartoonish in its animation, which actually lends a good feel to the game. The design for each character meshes in well with the respective individual backstory and play style. There is only one court to play on, so variety in the environment isn’t really there. This may be something that JoyCity is potentially keeping in mind for updates to the game. Music in the game is handled by the various rap tracks that seem to be of the underground or homemade variety. As this is a street basketball game, it goes with the theme. For a free-to-play title that contains microtransactions but IS NOT pay-to-win, 3 On 3 Freestyle is definitely worth giving a run. The game does lack game modes and game depth, but the fact that there is value in playing to unlock various things does make the longevity of the game appealing. The possibility that there is more to be added into the game does make it a promising title that could be worth the time. If you’re too used to the bigger titles that are usually put out, this game may not be for you, but again, it is a free title and could surprise you.